COUNCILLOR Keshminder Singh, who had questioned the presence of Subang Jaya assemblyman Hannah Yeoh at the Subang Jaya Municipal Council’s (MPSJ) full board on Thursday will have to submit a written explanation. State Local Government Committee chairman Ronnie Liu, who described the incident as uncalled for, said this was necessary to prevent such incidents repeating in the future. Saying Yeoh had every right to be at the full board meeting, Liu said PKR’s Keshminder would be asked to explain his action. He said he spoke to Keshminder on Thursday and felt that it was only fair that a written explanation was obtained from him. As the people’s elected representative, Liu said, the Subang Jaya assemblyman was only doing her job, by being at the council meeting. Furthermore, he said, findings also revealed that she had obtained the permission of the MPSJ president to be there. Meanwhile, several DAP councillors of the MPSJ have submitted a petition declaring their dissatisfaction over Keshminder’s objection to the attendance of Yeoh. Eight DAP councillors submitted their signatures to the MPSJ president Datuk Adnan Md Ikshan yesterday at the council to voice their displeasure over the remark Keshminder made. Under the Local Government Act, there is a clause that states that state assemblymen and even MPs can attend full board meetings as observers. Also present at the petition handing over in MPSJ were Kelana Jaya MP Loh Gwo-Burne, Seri Kembangan assemblyman Ean Yong Hian Wah, Kampung Tunku assemblyman Lau Weng San and Yeoh. Councillor Tan Jo Hann, who was quoted earlier as concurring to Keshminder’s remark, clarified his statement. “I agree with Keshminder in principle that not anyone can sit at the council’s table, but in this case, the YDP and Hannah have given sufficient explanation about the technical part. “So it’s definitely a non-issue,’’ said Tan. Yeoh, in her blog, said she had not occupied any councillor’s seat and was only sitting at the end of the table on an extra chair. “This incident would not affect me and I will continue to be present in future full board meetings,” said Yeoh. The party election has come to an end. Over 700 DAP central delegates nationwide had elected their top 20 leaders into the Central Executive Committee (CEC). The twenties together with another ten co-opted CEC members will determine the direction of the party for the next three years. There are a total of 15 candidates from Selangor contesting the top position in the party and only Teng Chang Khim, Tony Pua and Gobind Singh managed to make it to the top 20. My collegue, Sdr Ean Yong Hian Wah, the party Selangor Chairman and Selangor Exco in charge of new villages dropped out from the top 20 position. He garnered 188 votes, I stood at 48th position with only 75 votes, about one tenth of the total votes casted. Some reporters ask me what is my comment when Sdr Ronnie, Sdr Ean Yong and I were defeated in the contest and whether this will affect our leadership in Selangor DAP. My answer is very simple, that it will have not much effect. As I said earlier, we have 15 candidates from DAP Selangor out of a total of 58 candidates contesting for party election, our votes in Selangor are fairly divided and we have to rely on delegates from outside Selangor. Bear in mind that most of the 15 candidates are new faces. We are either first time elected representative or first time contesting position in the CEC, it will be an uphill task for us to reach out to delegates outside Selangor. With that, most of us only manage to get the minimum supports from our Selangor delegates, plus a few from Federal Territory delegates as bonus votes. There are still times for the young leaders to climb up the ladder in the Party. What we need to do is to prove ourselves in years to come. A big slap on Najib's face as Anwar secure an even bigger majority. I congratulate Sdr Dato’ Seri Anwar Ibrahim for winning the Permatang Pauh by-election unofficially. Unofficial results I received from various electronic media and friends from Permatang Pauh show that Sdr Anwar is leading with a majority from 15,000 to 19,000. This is indeed a strong endorsement for Anwar Ibrahim and Pakatan Rakyat from the people of Permatang Pauh. For the past ten days, Malaysians especially voters of Permatang Pauh witnessed the strong and powerful BN machinery in trying to wrest the seat from PKR. Malicious and defaming accusations were thrown against Anwar Ibrahim. Still the people of Permatang Pauh stood strong behind Anwar Ibrahim and Pakatan Rakyat. The Malay votes in Permatang Pauh have been a key factor for both sides. UMNO is desperately playing its racial cards and Malay Supremacy agenda (Ketuanan Melayu) against Anwar Ibrahim. Anwar Ibrahim was even lamented as a puppet of DAP. Deputy Prime Minister Najib Razak was fully in charge of BN’s machinery against PR (as usual). UMNO came out with “kabinet babi” poster to stir racial sentiments among the Malay voters, Najib himself even went to the mosque to take oath that he does not know Altantuya in defending himself. Despite all these efforts, the Malay voters in Permatang Pauh remained unperturbed and gave their solid supports to PR, DAP and Anwar Ibrahim. Yes, BN and Najib have failed miserably to capture the seat from PR. And their purpose to reduce Anwar’s majority remained unachieved. In fact, Anwar could win the battle with a higher majority with comparison to what Wan Azizah achieved last General Election. As a DAP member, I would like to thank the people of Permatang Pauh, especially the Malay voters for the support shown. Their strong endorsement somehow shows that they no longer believe in BN’s propaganda. If BN continues with its ignorance, I believe their days in Putrajaya are numbered. The party election has come to and end. 700 over central delegates of the DAP nationwide has elected their top 20 leaders into the Central Executive Committee (CEC). The twenties together with another ten co-opted CEC members will determine the direction of the party for the next three years. According to Malaysiakini, the PM will announce reduction of fuel price. For those who had conversed with me before on Permatang Pauh by-election, I had expected BN to come out with sudden tactic to surprise Anwar Ibrahim and Pakatan Rakyat, including the sudden deduction in fuel price though PM had announced that oil price will not be reduced before 31st August 2008. Some may argue that it does not look good for the PM if he announce the reduction though he had mentioned that oil price will not be reduced. Well, if that is the case, I would like to raise a few examples here. First the PM had once announce on 12th February that the Parliament will not be dissolved on 13th February. And the Parliament was dissolved on 13th February. Secondly, the PM announced that oil price will not be increased before September 2008 till the government decided on a new mechanism to fix oil price, and the oil price increased on 4th June 2008. With these examples, do you think you can still believe in our PM's promises? Prime Minister outlined four major weaknesses of our public transportation system, i.e. over congested compartments, unsatisfactory services, insufficient frequency and insufficient coverage network. I believe that if PM were to travel from his official residence in Putrajaya to Serdang KTM station by bus, he will have more grievances and complaints as there is no bus-stop in front of his official residence in Putra Perdana. Public transportation has become an important issues, not only because it will be the focus of the upcoming budget after the steep fuel price hike in June 2008, but it is an issue that cut across all racial and religious backgrounds. A city without an efficient and reliable public transportation system will not be a livable city, especially when urban folks from the lower income group have to rely heavily on public transportation as their major mean of transportation. A lot of people, mainly office workers have turned to public transportation as their daily mean to travel back and forth to their workplaces after the fuel price hike in order to cut down their reliance on personal vehicles and petrol. In fact, the number has been on the growth since petrol price was increased by 30 sen in in 2006. However, with the increasing numbers of commuters and passengers, public transportation operators in Klang Valley especially Syarikat Prasarana Negara Berhad (or Prasarana) have failed miserably to meet the demands of the passengers. Prasarana is a wholly-owned Government company under the Ministry of Finance Inc., which was set up to own the assets of selected public transport companies, including the two light rail transit (LRT) lines namely the Ampang Line (or formerly known as Star LRT) and Kelana Jaya Line (or formerly known as PUTRA-LRT). Prasarana also supplied 1,055 new buses as of April 2008 to service routes within the Klang Valley. Both the LRT and bus services are operated by Rangkaian Pengangkutan Integrasi Deras Sdn Bhd (RAPID KL) a wholly-owned Government company under the Ministry of Finance Inc. In December 2007, Prasarana took over the assets and operations of KL Monorail System which is currently being managed by KL StarRail Sdn. Bhd. (KLSR) a wholly-owned subsidiary of Prasarana. For the past one month, there are numerous reports of breakdowns on the two LRT systems, not to mention the many unexpected delays in bus sevices. I have been trying to make an appointment with the management of RapidKL and prasarana but was unfortunately poured with cold water (Please refer to the email). In an email I sent to RapidKL to seek for an appointment in relation to the frequent breakdown of the LRT services, I was given a reply a few days ago only after several follow-ups and that I was asked to arrange the meeting through Petaling Jaya Municipal Council (MBPJ). I wonder what has MBPJ to do with the breakdowns. Why an elected representative has to turn to MBPJ in order to convey the message of the people to the management of RapidKL? There are many major issues concerning public transportation at various level. For example at the policy level, there are dispute why public transportation is put under various ministries when there should be one ministry to fully overlook public transportation? DAP MP for Petaling Jaya Utara YB Tony Pua yesterday raised a question on on the status of the Commission of Public Transport (Suruhanjaya Pengangkutan Awam) promised by the Prime Minister in his speech to the parliament on the 26th June 2008. YB Tony Pua and I were equally disappointed as the government has not made any decision on the set up of the Commission. I hope both PM and the Transport Minister can look into Prasarana’s serious lack of concern in improving public transportation in Klang Valley. I have written a letter to the Selangor Mentri Besar which is copied to all Exco members of the Selangor State Government on the recent reports carried by The Sun on hillslope development in Selangor. I have made an attempt to alert the state government on the prescribed development allowed for hillslope under Selangor Structure Plan which was gazetted on 14th June 2008. Any other activities outside the prescribed development shall not be allowed until the Structure Plan is amended according to proper procedure. Zon KSAS ini meliputi kawasan di bahagian timur Negeri Selangor iaitu di dalam Daerah-Daerah Hulu Selangor, Gombak dan Hulu Langat. la terdiri daripada kawasan tanah tinggi serta berbukit dan kawasan pembangunan di lereng bukit. Di Daerah Hulu Selangor, zon ini meliputi kawasan berbukit yang telah dimajukan dengan aktiviti petanian. Aktiviti pembangunan di zon ini perlu dikawalselia kerana kawasan ini mempunyai kepentingan dari aspek pemeliharaan dan pemuliharaan KSAS di mana ia meliputi kawasan berbukit yanq mempunyai ketinggian melebihi 150m. Di Daerah-daerah Gombak dan Hulu Langat, zon pembangunan terhad meliputi kawasan pembangunan perumahan di lereng-lereng bukit. Di Daerah Hulu Langat, ia juga meliputi kawasan pertanian dan petempatan desa. Pengawalan pembangunan di dalam zon ini adalah untuk memastikan aktiviti pembangunannya dikawalselia bagi mengelakkan masalah hakisan dan tanah runtuh. Ia juga untuk memastikan corak pembangunan pada masa hadapan tidak akan mendatangkan masalah alam sekitar. Zon ini meliputi pemuliharaan hutan-hutan simpan sedia ada yang terdiri daripada hutan tanah tinggi di bahagian Timur Negeri Selangor. Kawasan hutan simpan ini kebanyakannya adalah kawasan berkecerunan melebihi 25o. Pemuliharaan kawasan hutan juga meliputi kawasan hutan paya gambut di Daerah-daerah Kuala Selangor, Sabak Bernam dan Kuala Langat serta hutan paya bakau di kawasan Klang. Hutan Simpan Kekal (HSK) yang terletak di dalam Zon Wilayah Lembah Klang dan Pinggiran Wilayah Lembah Klang juga akan terus dipulihara. Pemuliharaan ini adalah selaras dengan kepentingan hutan ini sebagai kawasan tadahan air, hutan perlindungan hidupan liar, perlindungan biodiversiti dan juga untuk keseimnbangan persekitaran. Walau bagaimanapun aktiviti pembangunan terpilih boleh dibenarkan di dalam zon ini untuk aktiviti pelancongan eko serta pembelajaran dan penyelidikan di kawasan yang sesuai. Di mana perlu dan sesuai beberapa kawasan akan diwartakan sebagai Taman Negeri Selangor di bawah enakmen Taman Negeri Selangor 2005. SHAH ALAM: The Shah Alam City Council members were unanimous in their decision to deny Green City Amusement Fair Sdn Bhd its application to hold an amusement fair in the city. The application was denied at the full board council meeting held at the MBSA building yesterday. Green City Amusement had applied for a permit to hold a month-long fair beginning Aug 1 at the Shah Alam Stadium car park areas. Councillor Ahmad Sayutzi Bashiron objected to the application as the fair would affect the income of the traders in Bazarina (weekend market), which is held weekly at the stadium car park. "I have received complaints from the weekend traders that their business would be badly affected if MBSA allowed the amusement company to operate at the stadium as they (amusement company) will have a bigger portion of the car park areas and many attractions," said Ahmad Sayutzi. He said he had also received complaints that a fair held by the same company last year in the Bukit Jalil Stadium had activities associated with gambling. Councillor Datin Nor'ini Md Top also dismissed such entertainment activities as unnecessary in view of the current economic conditions, adding that the fair would only create social problems for Shah Alam residents. Councillors Izham Hashim and Norhalim Sirome were of the view that entertainment should not be totally rejected in the city but that it should be closely monitored and controlled by MBSA and free of vices like gambling. PETALING JAYA Kewujudan dua bangunan di Jalan SS3/9 menimbulkan persoalan kepada penduduk Kampung Baru Sungai Way kerana tapak bangunan itu terletak dalam zon penampan.Bangunan berkenaan yang didakwa milik Rukun Tetangga kawasan itu tetapi dinamakan Dewan Respon telah terbiar sejak beberapa ketika manakala sebuah lagi dijadikan kelas tadika oleh pihak tertentu. Bagaimanpun, dakwaan Dewan Respon itu adalah milik Rukun Tetangga SS3 boleh dipertikaikan kerana pejabat Rukun Tetangga kawasan itu yang sebenar terletak berdekatan dengan Warung Wawasan. Masalah itu mendapat perhatian Ahli Dewan Undangan Negeri (ADUN) Kampung Tunku, Lau Weng San yang mengunjungi tempat tersebut baru-baru ini. Katanya, beliau telah mendapatkan maklumat status sebenar tapak tanah tersebut daripada Pejabat Daerah dan Tanah Petaling dan disahkan tapak bangunan itu terletak dalam kawasan yang diwartakan sebagai kawasan lapang. "Mereka (Pejabat Daerah dan Tanah Petaling) juga memberitahu tiada sebarang permohonan diterima daripada mana-mana pihak untuk menggunakan tanah berkenaan,'' katanya. Oleh itu, katanya, beliau telah mengemukakan permohonan kepada Majlis Bandaraya Petaling Jaya (MBPJ) supaya kedua-dua bangunan itu dirobohkan atau diberi hak milik kepada penduduk tempatan. "Ini kerana penduduk di sini amat memerlukan tempat untuk menjalankan aktiviti perhimpunan dan kegiatan riadah mereka. "Saya harap MBPJ boleh bertindak tegas kepada pihak tidak bertanggungjawab dan sewenang-wenangnya mendirikan bangunan di sini tanpa kebenaran pihak berkuasa,'' katanya. Difahamkan pihak penduduk di situ akan mengemukakan permohonan kepada Pejabat Daerah dan Tanah Petaling untuk memohon tapak tanah terbabit. "Jika diluluskan oleh pihak kerajaan negeri, mungkin penduduk di Sungai Way dan SS3 boleh mendapat manfaat dan mempunyai sebuah tapak untuk menjalankan kegiatan kemasyarakatan,'' katanya. I have lost count on the number of mails and emails I sent to RapidKL requesting for a dialogue on the numerous break-downs. I checked my first mail which was sent out on 31st January and till this second, I haven't received any feedback from their management. I am not pointing any fingers but looking at the recent petrol price hike and the higher demand on an efficient public transportations, the general public need to know the reason behind the numerous service break-downs of RapidKL. I will try again for a few more days. If the management is still silent on the matter, I will probably have to send a memorandum to them. KUALA LUMPUR 8 Ogos - Langkah menebang kesemua pokok di cerun bukit di kawasan tangki air Taman Seaport, SS3 di Petaling Jaya baru-baru ini adalah perlu demi keselamatan penduduk berdekatan. Pengurus Besar Bahagian Komunikasi Korporat dan Hal Ehwal Awam Syarikat Bekalan Air Selangor Sdn. Bhd. (Syabas), Abdul Halem Mat Som berkata, penebangan pokok-pokok di situ dilakukan kerana pihaknya mendapati struktur cerun berkenaan tidak kuat. "Melalui siasatan yang dilakukan, kawasan tersebut didapati telah mengalami hakisan dan runtuhan serta kewujudan pokok-pokok besar di cerun itu akan mengundang bahaya kepada para penduduk terutamanya di Jalan SS 3/51. "Jurutera perunding yang dilantik oleh Syabas mengesahkan bahawa terdapat keperluan yang mendesak untuk memperbaiki serta menguatkan keseluruhan cerun di kawasan tapak tersebut. "Kaedah yang digunakan ialah soil nailing, menaik taraf sistem perparitan, memotong pokok di cerun serta menanam rumput bagi menutupi permukaan cerun tersebut," jelasnya dalam satu kenyataan kepada Utusan Malaysia hari ini. Beliau mengulas laporan Utusan Malaysia baru-baru ini mengenai aduan penduduk yang tidak berpuas hati dengan tindakan Syabas memotong pokok di cerun bukit kawasan tangki air di Taman Seaport. Penduduk mendakwa, tindakan Syabas itu telah menghapuskan kawasan hijau serta memusnahkan habitat beberapa jenis haiwan termasuk burung helang, tupai dan monyet. Abdul Halem berkata, pihaknya telah mendapat kelulusan daripada Majlis Perbandaran Petaling Jaya (MBPJ) untuk menjalankan kerja-kerja berkenaan menerusi dua pucuk surat bertarikh 13 April dan 26 Mei lalu. Syabas juga, ujar beliau, telah mengadakan empat sesi perbincangan bersama Ahli Dewan Undangan Negeri Kampung Tunku, Lau Weng San; Ahli Parlimen Petaling Jaya Utara, Tony Pua dan penduduk sepanjang pelaksanaan kerja pembaikan tersebut bagi menerangkan keadaan cerun serta kaedah pembaikan di kawasan itu. Menurutnya, pada peringkat awal, Syabas memang bercadang untuk melakukan pemotongan pokok-pokok secara berpilih tetapi menukar keputusan itu selepas mendapat saranan daripada jurutera perunding. "Setelah mengambil kira keselamatan penduduk dan juga saranan daripada jurutera perunding, penebangan keseluruhan pokok yang kebanyakannya berumur di antara 10 hingga 25 tahun di kawasan cerun berkenaan adalah perlu kerana didapati pokok-pokok itu telah reput dari dalam dan hanya menunggu cuaca lembap seperti hujan serta angin kuat bagi menumbangkannya. "Pokok-pokok itu juga berisiko membahayakan keselamatan para penduduk di kawasan terlibat memandangkan jaraknya adalah kira-kira lima hingga 10 meter dari rumah-rumah penduduk," jelasnya. Mengenai penebangan pokok-pokok di kawasan yang kurang curam, beliau berkata, Syabas berpendapat bahawa langkah mencegah adalah lebih baik sebelum berlaku runtuhan cerun dan pokok tumbang yang akan membahayakan struktur bekalan air serta penduduk setempat. "Oleh demikian, cerun yang pada pandangan penduduk tidak bahaya juga telah diperkukuhkan untuk faedah jangka masa panjang," katanya. Abdul Halem memaklumkan seluruh kawasan itu termasuk daun dan batang pokok telah dibersihkan dan pagar sementara telah dipasang. Menurutnya, keseluruhan kawasan cerun yang telah diperkukuhkan itu akan ditanam semula dengan rumput bagi menghijaukan kembali kawasan itu setelah semua kerja-kerja selesai. "Penanaman semula pokok di cerun itu tidak digalakkan kerana kedudukannya yang tidak sesuai dan tidak akan membantu mengukuhkan tebing kerana akarnya tidak boleh mencengkam kuat. "Sekiranya kerja-kerja pembaikan tersebut tidak dilakukan dalam masa terdekat, risiko berlaku kejadian runtuhan adalah besar walaupun penduduk mendakwa tidak pernah berlaku runtuhan," katanya. Ingin dimaklumkan bahawa sesi berjumpa rakyat oleh ADUN Kampung Tunku Lau Weng San di Pusat Perkhidmatan DAP Taman Paramount yang dijadualkan pada 13 Ogos 2008 akan dibatalkan. Sebarang aduan boleh diemelkan kepada beliau di lauwengsan@gmail.com atau memanggil ke talian 03-78754724 untuk meninggalkan sebarang mesej. Please be informed that the meet the people session by Kampung Tunku State Assemblyman Lau Weng San on 13th August 2008 at DAP Taman Paramount Service Center will be cancelled. Please email him directly at lauwengsan@gmail.com or call 03-78754724 to leave a message for any complaint. Mengapa tidak boleh duduk diam-diam berbincang? Saya berasa amat terkejut dan sedih dengan perkataan-perkataan yang dikeluarkan daripada mereka yang mengadakan demonstrasi di hadapan bangunan Majlis Peguam Malaysia pada pagi ini yang membantah sebuah forum awam berkenaan pemelukan Islam anjuran Majlis Peguam. Antara perkataan dan sepanduk yang ditunjukkan ialah "Hancur Bar Council", "Hidup Islam", "Batalkan Forum", "Jangan cabar Islam”, "Jangan cetuskan kemarahan umat Islam demi keharmonian umat Islam", "Awas Persatuan Peguam, jangan bermain api" dan "Menjunjung keadilan, menyanggah kezaliman". Lebih mengecewakan dan mengaibkan lagi ialah laungan “babi”, “pengkhianat” dan “Balik China” juga kedengaran daripada kalangan peserta demonstrasi tersebut seperti yang dilaporkan oleh media elektronik. Cara demonstrasi ini ditangani telah menimbulkan perasaan tidak senang di kalangan semua rakyat Malaysia yang berfikiran wajar. Perkataan dan sepanduk yang dibawa mereka seolah-olah menunjukkan rakyat bukan Islam sedang dan ingin mencabar Islam, di mana ini adalah tidak benar sama sekali. Saya berasa kecewa apabila dua orang Ahli Parlimen daripada komponen parti Pakatan Rakyat (PR) iaitu Zulkifli bin Noordin (PKR – Kulim Bandar Baharu) dan Salahuddin Ayob (PAS – Kubang Kerian) mengetuai rombongan demonstrasi yang dilaporkan. Pada pendapat saya, kedua-dua mereka perlu ditegur atas tindakan mereka ini kerana demonstrasi ini telah dicemari bukan sahaja ekstremis Islam, malahan ekstremis perkauman UMNO! Rakyat Malaysia yang pelbagai kaum dan agama harus memahami kepelbagaian dalam masyarakat kita dan sama-sama bertukar fikiran untuk mencari jalan penyelesaian dengan aman, bukan melalui keganasan, perkataan-perkataan kesat atau cara-cara yang tidak bertamadun dan tidak Islam. Saya memuji sikap Muslimat seperti Dr Mehrun Siraj dan Latheefa Koya, yang kebetulannya kaum wanita (mungkin kerana topik perbincangan ini turut melibatkan kebajikan wanita bukan Islam). Sikap mereka yang berani dan lantang menegur mereka yang tidak sopan, tidak bertamadun dan membelakangi ajaran Islam perlu dicontohi oleh mereka yang melabelkan mereka sebagai pejuang Islam. Dialog, musyawarah, rundingan, mesyuarat atau apa bentuk perbincangan merupakan cara manusia menyelesaikan konflik secara aman dan bertamadun. Ini khususnya penting dalam sesebuah Negara majmuk seperti Malaysia. Bayangkan, jikalau kita tidak berbincang apabila kita menghadapi satu masalah atau konflik, bagaimana kita dapat menyelesaikan masalah ini? Lagipun, masalah berkenaan dengan pemelukan Islam telah mendapati perhatian daripada masyarakat Muslim dan bukan Muslim di Malaysia kebelakangan ini. Mengapakah kita semua tidak dapat duduk diam-diam dan berbincang bagaimana kita dapat menyelesaikan masalah ini? Mengapakah kita perlu menutup peluang untuk bertukar fikiran? About 300 protesters have gathered outside Bar Council headquarters demanding that the lawyers group halt its controversial forum on ‘Conversion to Islam’ this morning. The Bar Council today, adhereing to the advice of the police - and an angry mob at its doorstep - wrapped up its half-day forum on 'Conversion to Islam' at 10am, an hour after it had started. Earlier about 300 protesters have gathered outside Bar Council headquarters demanding that the lawyers group halt its controversial forum on ‘Conversion to Islam’. 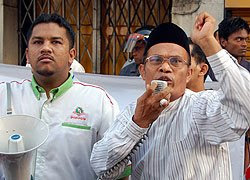 A leader of the protesters - PKR Kulim-Bandar Baharu parliamentarian Zulkifli Noordin - declared the abrupt end of the forum as a victory for them. By 10.40am, most of the protesters have dispersed. The open forum on the sensitive religious issue kicked off at 9am but angry protestors have given organisers half an hour to cancel the event. About 15 police officers and an Federal Reserve Unit truck have been deployed to the area and the road leading to the Bar Council office where the forum is held has been closed. In the bid to diffuse the situation, the police have told Bar Council to wrap up its forum by 10am. The protesters, many of whom are from Muslim welfare organsation Perkida and Islamic party PAS, shouted, “Hancur Bar Council” (Crush Bar Council), “Hidup Islam” (Long Live Islam) and “Batal forum” (Cancel the forum). They are carrying placards saying “Jangan cabar Islam” (Don’t challenge Islam) and “Bar Council, Don’t play with fire”. Among the protest leaders seen in the crowd are PAS Youth chief Salahuddin Ayub and Zulkifli. The protesters, many of whom came just before the forum began, later decided to sit down in front of the Bar Council building and vowed that they would not budge until the event had been cancelled. Some threatened to storm the building to physically stop the forum. Among the speakers at the forum was syariah lawyer Mohd Haniff Khatri Abdulla. Mohd Haniff represented the Federal Territory’s Islamic Religious Council in the case of R Subashini. K Shanmuga and Ravi Nekoo, who were counsel for Subashini and S Shamala, respectively, also spoke. The forum is moderated by Zarizana Abdul Aziz of the Women's Centre for Change. However, one speaker has pull out - former Syariah judge and currently the Federal Territory Islamic Department’s syariah prosecutor Dr Mohd Naim Mokhtar. Ministry of Foreigh Affairs has replied my complaint letter on "Good conduct certificate". The reply can be downloaded here. Baru-baru ini terdapat beberapa laporan wartawan dipukul semasa meliputi aktiviti Parti KeADILan Rakyat (PKR). Kejadian sebegini merupakan kejadian yang tidak sepatutnya berlaku, khususnya apabila berlakunya kejadian wartawan dikasari oleh petugas-petugas PKR semasa perhimpunan raksasa Protes di Kelana Jaya. PKR harus berubah dan memperbaiki kelemahan ini dan bukan terus mengulangi kesilapan ini. Jikalau indeks kebebasan media di Malaysia jatuh akibat kejadian ini, ianya akan merupakan sesuatu yang amat mengaibkan Pakatan Rakyat kerana ketiga-tiga buah parti PR masing-masing mempunyai komitmen yang kuat terhadap kebebasan media. Takrifan terhadap kebebasan media bukan sahaja dihadkan terhadap cara melaporkan sesuatu berita, ianya juga menyentuh tentang had atau kebebasan wartawan dalam menjalankan tugasnya. Oleh itu, beberapa pertubuhan NGO yang berorientasikan kebebasan media seperti Reporters San Frontier (RSF) di Paris juga akan menyebut tentang aspek ini apabila menilai tahap kebebasan media di sesebuah negara. Pertubuhan ini dalam laporannya juga menyentuh tentang keselamatan jurugambar yang membuat liputan di negara yang mengalami peperangan kerana para jurugambar selalunya menjadi sasaran mudah kerana peralatan fotografi yang digunakan mereka berbentuk seperti pelancar roket. Memang Malaysia bukan sebuah negara yang mengalami peperangan, maka perkara sepeti ini tidak patut berlaku. Biarpun begitu, peristiwa-peristiwa negative ini seringkali berlaku dalam beberapa perhimpunan PKR. Ianya akan pasti digunakan untuk menyerang PKR, PR dan Anwar Ibrahim sendiri. Selepas tsunami politik pada 8 Mac 2008, ramai opportunis di BN telah melompat ke parti-parti PR. Di Selangor, PKR telah berkembang dengan kadar yang pesat. Dalam tempoh ini, parti-parti komponen PR harus berwaspada untuk memastikan unsur-unsur negatif dalam BN tidak akan diserap ke dalam pertubuhan kita apabila kita membuka pintu kepada ahli bekas BN. Ini adalah kerana sesebuah parti yang berkembang pesat pasti akan menyerap unsure-unsur negatif ke dalamnya. Saya tidak ingin mencampur tangan dalam urusan pemilihan ahli atau petugas-petugas parti PKR kerana ini merupakan hal dalam PKR. Biarpun begitu, sepeti apa yang saya bangkitkan dalam satu kenyataan berkenaan dengan “muzakarah” dan “muqabalah” antara PAS dengan UMNO, jikalau PKR tidak dapat memperbetulkan kelemahan ini, ianya akan memberi kesan negatif kepada PR. Oleh itu, saya menyeru PKR supaya menjalankan “kawalan kualiti” atau “quality control” terhadap ahli-ahli atau petugas-petugas partinya demi memastikan peristiwa mengasari atau memukul wartawan ini tidak berlaku lagi kerana parti-parti komponen PR tidak boleh berkali-kali berbuta babi mempertahankan PKR. THE matter of the illegal funeral parlour along Jalan Gasing will be discussed by the Petaling Jaya City Council at their One Stop Centre (OSC) meeting tomorrow. Malay Mail highlighted yesterday that the Gasing Memorial Service had been operating illegally for 15 years. Five councillors, including mayor Datuk Mohamad Roslan Sakiman, will discuss the matter and submit their recommendations at the council’s full board meeting. Newly appointed councillor Derek Fernandez said the OSC meeting would decide on matters pertaining to planning and development in Petaling Jaya. “The residents in the area have protested against the parlour in the past. But we need more details for a more informed decision to be made,” said Fernandez. Some of the State assemblymen contacted by Malay Mail opined that the parlour should be shut down immediately for the simple reason that it is illegal and poses a problem to residents. Kampung Tunku assemblyman Lau Weng San said an alternative site should be proposed. “I understand that the parlour caters to the lower income group. The matter should be handled in such a way so that this group is not affected,” he said. Petaling Jaya Utara MP Tony Pua saw a need for the council to flex its muscles as the parlour had been defiant. “There is no excuse. If they are illegal, they should not be allowed to operate. Not in the present location anyway,” said Pua. Sri Andalas assemblyman Dr Xavier Jayakumar wanted to know how many compounds the parlour had been issued. He felt the parlour should have been forced to cease operations a long time ago. However, Bukit Gasing assemblyman Edward Lee was more sympathetic, pointing out that the parlour was drawing up plans to make the place more environmentally friendly. “Once the proposal is completed, let the parlour discuss it with the residents and the council. Let’s look at that first,” Lee said. KAMPUNG Tunku assemblyman Lau Weng San wants the authorities to demolish two community halls illegally built on state government land in SS3. Following a tip-off from residents, Lau conducted an investigations at the land office. He then discovered that the halls were constructed without getting the necessary approvals. Signboards indicate that one is a Jalan SS3/39 Response Hall built for the SS3 Rukun Tetangga (RT) and another is the Seri Setia Pekan Branch Umno Office. Lau said the response hall was hardly used and that the Umno office served as a nursery in the mornings. “I did some investigation at the Petaling Land Office. “The officer said the two buildings are located in an open space and no application forms had been submitted to the office. “Based on the plan, the land where these halls are located is empty and has no boundary or plot numbers, therefore I conclude that these buildings are illegal,” said Lau. He suggested that the Petaling Land Office issue an eviction order for the two buildings, and either have them demolished or be used as a community hall by the various associations in Sungai Way. Lau said the residents needed a a community hall where they could gather and have their activities, citing the Sungai Way New Village Youth Club as an example. “The club used to run its operations and a nursery on a piece of government land in Sungai Way, until the construction of a low-cost flats forced them to move out. “They then rented a house in SS9 as their operations centre and nursery, but there were complaints by residents because of its location and that the quota for underprivileged homes in SS9 had filled up. “Hence the club is desperate for a new premises and approached me for help. “They are willing to pay the necessary fees and licences for a new place,” said Lau.